Kiki's Ultimate Guide to Ladakh. Let's start right from the basics. Ladakh is one of the three distinct Regions in the state of Jammu and Kashmir with the other two Regions being Kashmir and Jammu. All the three Regions of the state have their own distinct identity and their own set of cultures. Let's talk about Ladakh today and try and understand this much visited but little known part of our Country. The word Ladakh itself comes from the Tibetan “La” which means a Mountain Pass and “Dvags” which means land. Hence the name of Ladakh means the Land of Passes which it surely is as this article “La-Dvag Land of Passes” shows. The Ladakh region consists of two districts. The Leh District and the Kargil District. Some parts of Ladakh are under illegal occupation of our neighbours so we will keep those parts out of the purview of this article. 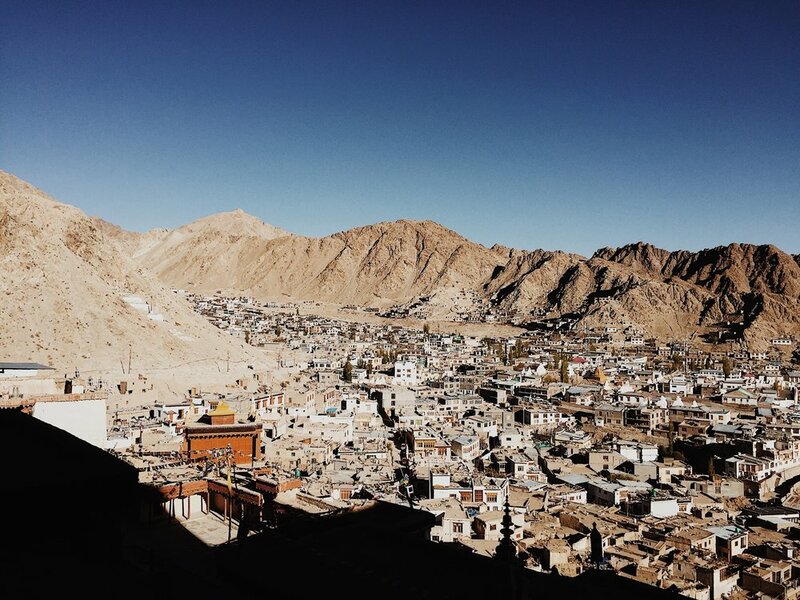 Leh District itself is over 45,000 sq km which makes it larger than the state of Haryana. Kargil District has a size of around 14,000 sq km. Put together both these districts which make up the Ladakh division which has a total area of 59,000 sq km. Thats makes Ladakh bigger than Himachal Pradesh or Uttarakhand. In fact the total area of the Ladakh region if we consider the areas under occupation is more than 87,000 kms. Ladakh historically used to include Baltistan as well as Gilgit also, as described in this Article, but these areas are now under Pakistani occupation since Independence. Besides these a large part of Ladakh in the Trans Karakoram region between the Karakorams and the Kun Lun, the Aksai Chin continues to be under Chinese occupation. You can go to Ladakh by Air and by Road as well. Leh Airport is well connected with many Domestic Airlines having regular flights to Ladakh. You can also go by Road to Leh though this option is available from May onwards from the Srinagar side and June onwards from the Manali side. The recommended Route by Road is going via Srinagar as you acclimatize well going through this Route and there are no restrictions or paperwork required for the same. You can make a complete circuit by coming down from the Manali side. This Guide is specifically meant for the People who really want to get an essence of Ladakh and its culture. Who want to move beyond the stereotype and experience the real essence of Ladakh. Leh Town itself boasts of a lively walking only Bazaar and has many places you can visit. Len traditionally was an important Trading town as it stood on the Silk Route which connected it to Yarkand over the Karakorams which was sometimes called the Worst Trade Route in the World. The Old Palace, the Zorawar Fort, the Central Asian Museum and the Shanti Stupa are some of the interesting places that you can visit around the town. I would especially recommend the Central Asian Museum as it had great architecture and a great collection of Central Asian and Ladakhi antiquities but unfortunately Photography is prohibited inside the Musuem Building though you can take pics in the compound. The Oldest Mosque in Leh is just adjacent to the Museum. You should also try and pay a visit the Donkey Sanctuary around Leh. There are a number of interesting places within easy driving distance from Leh. You can visit the Palaces at Shey and Stok. You could see the amazing Ice Stupas at Phyang which would hopefully make a difference in greening the cold Desert. You can also visit the Sangam where the Indus is joined by the Zanskar River and do some Rafting if you are up to it. And of course there are many Monasteries around Leh which you can visit and have a flavor of the Tibetan Buddhism followed in these parts. Some of the major recommended ones include Alchi, Lamayuru, Hemis, Stakna, Matho, Diskit and Thiksey. Historically Buddhism came to Ladakh and Central Asia via Kashmir and the same is reflected in the Arts in the Monasteries. The Gilgit Manuscripts found in Gilgit show that the whole region acted as a bridge between the Indian sub-continent and Central Asia. North of Leh across the Khardung La lies the Nubra Valley which lies sandwiched between the Himalayas and the Karakorams. 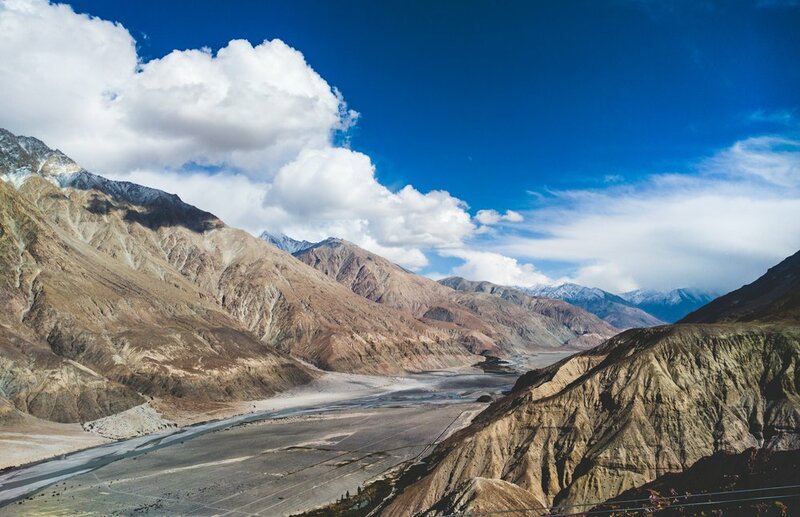 To get to the Nubra Valley from Leh you have to cross the Khardung La, which is one of the highest Passes in the world and is quite a tourists attraction itself. The Pass itself offers great views of the Zanskar Range on one side and the Karakorams on the other side. The most prominent of the sub Ranges of the Karakorams, visible from the Khardung La is the Sasser Muztagh, which includes the Sasser Kangri Peaks. It should be pertinent to mention here that out of the nine sub Ranges of the Karakorams, 3 lie wholly in Indian territory while one lies partly. On the Nubra Valley floor the Shyok River is considered the divide between the Himalayas on one side and the Karakorams on the other side. You can go to Hunder and ride the Bactrian Camels in the sand dunes. These Bactrian Camels are originally from Central Asia and are a nostalgic reminder of the times when Caravans crossed over the these forbidden Mountains linking the region with Central Asia. You can also go to Panamik and Diskit and visit the Diskit Monastery which has a large statue of the Buddha against a great backdrop. .You can further go till Turtuk which is a part of Baltistan with a Balti population and its was under Pakistani occupation till 1971. It offers a peep into a Culture distinct from the Ladakhi culture. And recently the Army allows people to go further afield beyond Tyakashi and the the way upto the last Village Thang. Through the Valley is called the Nubra Valley the major River in this Valley is the Shyok River of which the Nubra is a Tributary. The Shyok finally joins the Indus near Skardu. The name of the Shyok River in the local language means the River of Death. In Eastern Ladakh you can visit the very famous Pangong Lake which itself is partially in India and partially in China. In case you are coming from Leh you need to cross the Chang La Pass while getting to the Lake. But now there is an alternate Route, with the opening of the Agham Shyok Route you can now Travel directly to Pangong Lake without coming back to Leh. This ride along the Shyok River is quite an exhilarating one. The Lake is by far the most popular Tourist destination in the region in my view and we can all thank Bollywood for that. A visit is also recommend to the more offbeat Tso Moriri and Tso Kar, which are Lakes with wetlands and have a great deal of Wildlife as well. Migratory Birds, Kiangs and Himalayan Marmots can be commonly seen in these areas. Please dont feed the Marmots as recently they are getting habituated to people which isnt right. The Pangong Lake with the Pangong Range in the background. The most enchanting drive in Ladakh in my view as it takes along the shores of Pangong Lake and then onto the Changthang Plateau crossing Chushul and going through some high Altitude wetlands rich in wildlife. The Changthang stretches far into Tibet and has a character of its own. The Indus also flows through the Changthang as it enters Ladakh from Tibet. The Village of Chushul lies on the way and it has some history to it. Not exactly South but South West of Leh lies the Hanle Observatory, one of the highest Astronomical Observatory in the World. This place has probably the least amount of light pollution in the Country hence the Observatory was built here. This place is favorite with people who want to do Astro-Photography. The Tso Moriri Lake is at an higher altitude than the Pangong Lake but supports a lot of wetland. The Village of Karzok at the shores of the Tso Moriri is one of the highest permanently inhabited place in the World. Recently the Government has announced the opening of more Roads in Ladakh areas for promotion of Tourism. Earlier these Roads could only be accessed through Special Permits which has to be procured beforehand. Hopefully in the future as well the Government will make more areas accessible to Tourists which would spread Tourism over a larger area in Ladakh than just being stuck as a few places. The Indus at the Changthang when it enters Ladakh from Tibet. The Sangam of the Indus and the Zanskar near Nimoo, the Alchi Monastery, the Fort and Monastery at Basgo and of course the beautiful Village and Monastery at Lamayuru. All these places have a very rich history as well. Alchi Monastery is known for its great Artwork. On entering the Kargil district while on the way you can stop at Heniskot and see the amazing ancient Fort of Chiktan. You can also see the Chamba Buddha carved out of stone on the way at Mulbekh. Now we come to the Kargil district. Though a big district by itself the name in Kargil is now sadly just related with a War that took place almost 20 years ago. This has overshadowed the significance of the places that Kargil has an offer from a Travelers point of view. 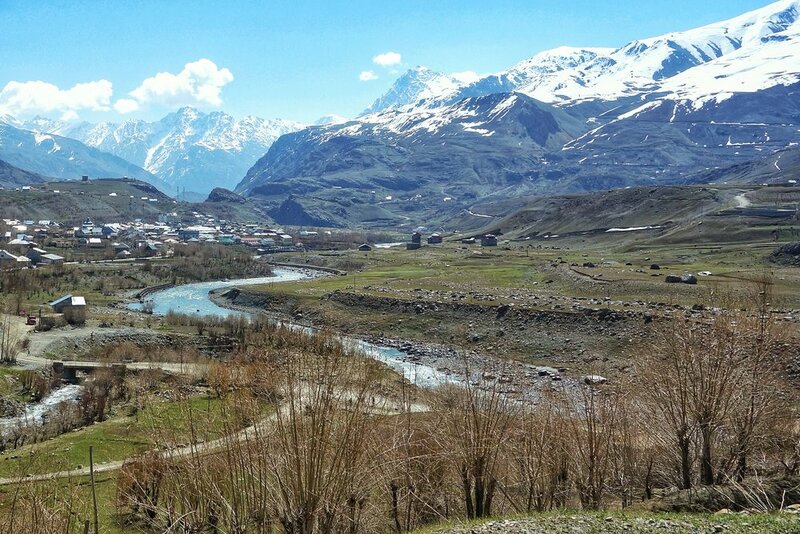 Kargil Town : Kargil town is by the Suru River and is basically a Bazaar Town with a main Market. The main attraction of Kargil is the Munshi Aziz Bhat Museum of Central Asian Antiquities. You can also have a stroll along the River. Even the Kargil Bazaar which still carries some flavour of a Central Asian Bazaar also makes a good place to roam around and get a look at the people as they go around their business. One of the few Old structures at the Kargil Bazaar. A Bazaar which still carries the flavour of an important Trading town enroute to Leh and beyond to Central Asia. To me it feels like going back in time. Crowded street, narrow alleys and you catch a glimpse of old architecture of the area. The Old Munshi Aziz Bhat Sarai is also in a dilapidated condition though most of its stuff has been moved to the exciting Munshi Aziz Bhatt Museum and it just lies off the Bazaar. The Musuem holds a great collection of Goods and Articles from the area as well as various places in Central Asia such as Saddles, Carpets, Silks, Jewelry and even a Passport issued to a Hoshiarpuri Trader based in Kargil at the Consulate at Chini Bagh in Yarkand. Around Kargil : You can visit the Ghost Village of Hundarman, which is now abandoned as a new Village has been built upslope from the original Village. The Village was under Pakistani control till 1971 after which it was bought under Indian control. The Village lies right on the LOC and you can look across the LOC River and see the old Kargil Skardu Road as well. There is a local Museum in Hundarman with various interesting items from the past. You can also visit the Village of Hardas which is famous for its Apricot Blossoms. There is also a local Museum at the site of the old abandoned Village with a collection of the articles from the time the Village was under Pakistani control. Everyday items made in Pakistan, a Currency note from 1947 with both Government of India and Government of Pakistan printed / stamped on them, utensils, games and what have you. A look into the past and how the Villages lived in this Village which was basically right on the borderline between not so friendly neighbours. There is even a Homestay now in the Village of Hundarman which offers you an opportunity like no where else to stay right at the Line of Control, on a broder which has been now peaceful for many years. 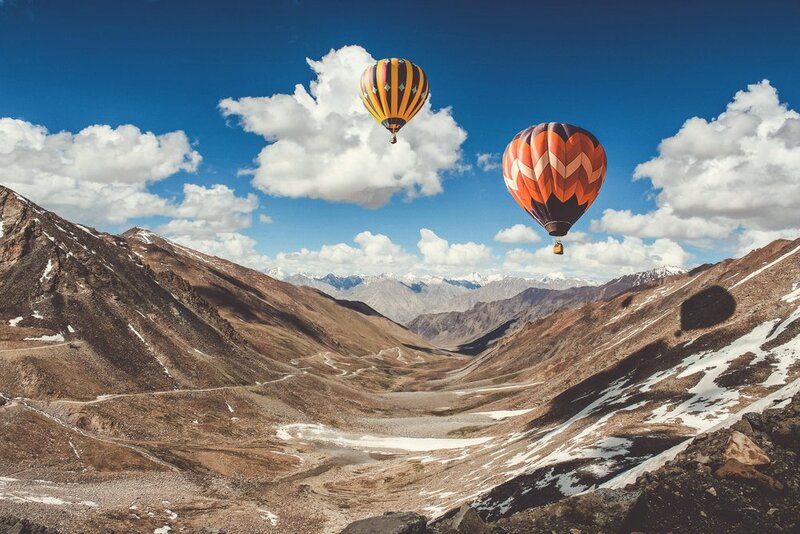 One the best parts of Ladakh in my personal opinion also lies close to Ladakh.Lying between the Zanskar Range and the Great Himalayan Range, the enchanting Suru Valley. It's the sort of place that's a Mountain lover's dream come true. Bounded by the 7000 er Giant Twins Nun Kun the highest Peaks of the Himalayas in Ladakh. You just don't get this kind of vertical elevation anywhere else in Ladakh and the Valley lies at an amiable altitude of around 10,000 which makes it more human friendly than any other place in Ladakh as well. The spectacular Valley where Kashmir meets Tibet. Suru Valley is the perfect Tribute to both.The main town of the Suru Valley is Sankoo seen here as it sits under the shadow of the mighty Himalayas. The drive through Suru Valley is a great one along the merrily flowing Suru River. You pass the Village of Trespone which has a beautiful Mosque perched on a Hill. Moving beyond before Sankoo you have Buddhist Rock carvings by the Roadside and you also have a Maitreya Buddha statue like the one in Mulbekh in Karste Khar. After the town of Sankoo we reach the Village of Panikhar which offers great views of the Nun Kun Massif. Besides being famous for being "The Second Coldest Inhabited Place in the World" (I often wonder where they came up with this stupidity ; it could well be the coldest inhabited place in India, which I would agree with) it also holds a unique place in the Geographically of Ladakh. Traditionally Drass was known as Hembabs with the word "Hem" meaning the same as it does in "Him" of the Himalayas. Basically a place which gets a lot of snow as this area got the most snow in the whole region. And also Hembabs is also the place with the most influence of Kacheeyul, which is the traditional Tibetan/ Ladakhi word for Kashmir. And a number of Kashmiris have traditionally come over here and settled here. And most interestingly the language spoken in Drass is Shina unlike the Purigi version of Balti spoken in Kargil and Suru Valley. The same language is spoken in the Gurez Valley in Kashmir as well. Shina is a one of the major languages of Gilgit Baltistan as well with 40% of the population supposedly speak Shina. Drass also has number of Dhabas run by the Baltis of Dehradun, who come up from Dehradun every year to run these Dhabas. Do visit the the Mushkoh Nallah, the Mushkoh Valley and the Mushkoh Village. The Mushkoh Valley is a valley in Ladakh, India. Considered to be glaciated and unsuitable for human habitation, it came into prominence in 1999 during the Kargil conflict when Pakistan infiltrated troops across the Line of Control. The Mushkoh valley is the limit of at the western extremity of Ladakh, west of which lies the northern reaches of the Kashmir valley.This almost Glacial Valley is said to be the coldest part of Hembaps / Hembaps as Drass used to be called. Yes Colder than Drass Town itself. Geographically it connects to Gurez over the Kaobal Gali which isn't open to general Public so far. You also have an option of going directly to Sankoo from Drass via the Umba La which offers great views of the Drass Valley and the Mountains behind including the quite famous Tiger Hill. 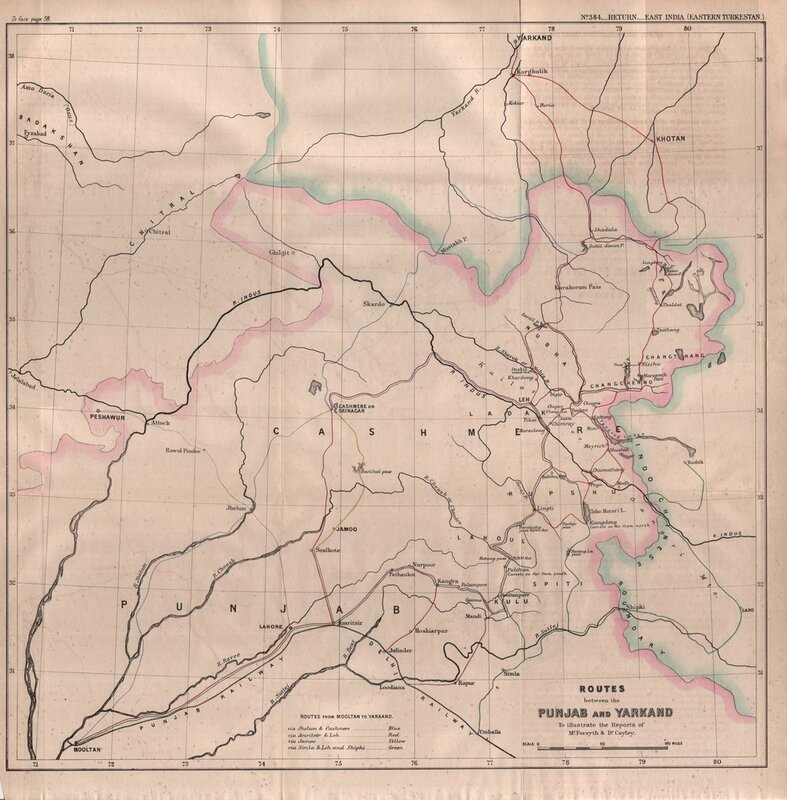 Looking into maps you would realise that this also lies at the edge of the Deosai Plateau. And the people here speak Shina which is the same as the people of Gurez as well as in Gilgit. Zanskar has an area exceeding 7000 sq km and a population estimated to be between 18000 to 20000. It is located bang in the middle of the Great Himalayas which separate it from Kishtwar and Lahaul in the South. In the East it touches Tibet almost and in the North is Ladakh and to the East is what used to be Baltistan but now better known as the Kargil area. Zanskar gets its name from the Tibetan word for Copper "Zang" and Valley. So probably it was because of the Copper deposits it was called so. And the name stuck. You can walk around the Padam bazaar and visit remains of the Old Mud Fort. Besides these there are many many Monasteries around Padam which can be visited within a short distance. You can visit the Monastery at Pibiting and you can also visit the larger Monasteries at karsha and Bardan which was one of the first Monasteries to be established in Zanskar. A visit to the Stongdey is also a must and further afield to Zangla which was once a Kingdom which was still being ruled by a Titular Ruler till a few years. If you are ready to trek you can visit the amazingly located Phugtal Monastery perched on a Rock on the Mountain Face. Built around a Cave it is still one of the few Monasteries in Ladakh not accessible by Road. The only way to get to it is by foot and everything gets to the Monastery on the backs of Men and Horses. Besides this general sightseeing Zanskar is a side of Ladakh which offers you a window into the past as to how life was in Ladakh in the times past. Though a part of Kargil District, culturally and religiously Zanskar is closer to Ladakh and carries a strong Tibetan Buddhist tradition though some Muslim communities also co-exist peacefully mostly in the Padam area. Zanskar is expected to face changes in the years to come as it gets connected directly to Leh via the Chadar Road being built along the Zanskar River. This Road will connect Padam to Nimoo, where the Zanskar meets the Indus River close to Leh. In addition to this another crucial connectivity Project is under was which will connect Padam to Darcha in Lahaul in Himachal Pradesh over the Shinko La Pass. With the opening of these two Roads many more Tourists are expected to come to Zanskar and long standing demands of the Zanskaris for better connectivity will also be met. Ladakh is a Trans Himalayan Desert with scantly rainfall with a Cold Climate. Below is a chart of the Average Temperature recorded at Leh. Please note that other places in Ladakh can get much colder and one of the coldest inhabited places in the Himalayas is Drass and Mushkoh with temperatures of below minus 40 being recorded there. If you are travelling in Autumn/ Winter / Spring make sure you carry enough warm clothes and thermals. Try and keep your head, ears and neck covered in the extreme cold and always dress in Layers. Carry Woolen Socks and Gloves as well. As mentioned earlier Ladakh is vast. Bigger than many states in India. And Public Transport options are rather limited. You can do either of two things, drive up in your own Vehicle and you read up some tips on Driving in the Himalayas here. Kindly note if you hire a Car from a Car Rental Company you can only drive around on the Highways and you cant take the Vehicle beyond certain points. The other option is Local Taxis. Taxis in Ladakh are expensive as compared to other parts of India but are the best way to get around. For the latest Rates and updates please visit the Ladakh Taxi Union Website. One important factor that you have to keep in mind while Travelling to Ladakh or any such area of altitudes over 9000 ft is AMS or Acute Mountain Sickness. At such high altitudes there is less Oxygen in the air than at lower altitudes and due to this the body takes time to adjust. The signs of AMS includes nausea, headache, general listlessness, loss of orientation etc. To put it simply its a very bad and painful condition. The best way to counter AMS is proper acclimatization especially when you arrive by Air. Ensure that you do not indulge in any physical activity within 24 hours of landing in Leh. Head straight to your Hotel on landing and lie down. Give your body time to adjust to the lower levels of Oxygen. Remember minimal physical exertion for the next 24 hours and avoid Alcohol and Smoking. You can take some preventive Medicine like Diamox but Acclimatization is the best prevention mechanism. Even after the prescribed 24 hours take it a little easy and just dont go hitting the High Passes the next day. And remember the only cure for AMS is descending to a lower Altitude.